Now up front, I feel I owe an apology to both the Heir of the Empire(/Thrawn Trilogy) and Dark Empire trilogies of novels and comics. In my zeal for Shadows of the Empires impact, I think I may have downplayed their respective impacts. Star Wars was almost dead in the water after the Ewoks and Droids shows had run their course. These two trilogies gave fans their first new stories with Han, Leia, and Luke since Return of the Jedi. They opened the floodgates to the EU, helped usher in a new wave of stories (upon stories), and created characters who would become linked to the franchise for years to come. If they hadn’t been a success, we wouldn’t have gotten to Shadows. Shadows proved there was a mass audience for Star Wars, these stories proved there was a fanbase who would keep the franchise going even without a film/multi-media push. I stand by my Shadows post, but I felt I needed to give credit where its due. Onto the post proper. Anyways, while writing about Shadows (and talking to Steve about what it would take to do a podcast ep on the EU), I started remembering just how much I enjoyed the EU. How much I dug it, and how much I miss it being in continuity. I get why Disney got rid of it, it makes sense – they can cherry pick what they want to adapt/change and make their own story going forward. But I still miss the stuff being part of the continuity. Now, let’s look at some of my favourite things (stories, games, characters) that have been moved to from the former EU into ‘Legends’ that I dug the most. These aren’t in any order, except for that last one. One of the things the EU got criticized for at points was its seeming obsession (through Palpatine and the Empire) with superweapons – heck, that’s something the movies have been criticized for as well, mostly because of the Death Star (let’s call the Starkiller base what it is) has featured 4 times. In the EU though, it’s on a whole different level. There has been both Deathstars, the Death Star Prototype, the Eye of Palpatine, the Galaxy Gun, the Eclipse, the Darksaber, the World Devastators, and more. Amongst the more is my personal favourite, the Sun Crusher. Featured in Kevin J Andersons ‘Jedi Academy trilogy’, the Sun Crusher is stumbled upon Han and company with force-sensitive Kyp Duron in the Maw installation – a hidden imperial facility (so hidden that that only Tarkin, who set it up, knew about it – so when he died, their contact with the outside was cut off). Within it they find the Death Star prototype, and the Sun Crusher: a nearly invincible ship (due to its Quantom Crystaline Armor) that is a piloted by a small crew with the ability to destroy entire star systems by causing their sun to go supernova (by firing its resonance torpedos (which featured a chemical compound) into the sun, and would cause the sun to break down and collapse within hours). Was it overpowered? Absolutely. But reading about a ship that could fly through a Star Destroyer unscathed AND take a shot for a Death Star super laser (a normal KO) was awesome. Plus, I love the idea of a small superweapon – it flies in unnoticed, fires into the sun, and you’re done. It instills more fear – you don’t know when it will strike. It adds a psychological aspect to the war. With the Deathstar, you see that thing coming well ahead of time. With this, you don’t have that. You don’t know it’s coming or when it will strike. When you see it, it’s already too late. I love that, and I would have loved to see a some of it incorporated into the films. The game(s) themselves, while suffering from repetition and short stories were a blast – and a HUGE part of that was the character(s) of Galen Marek and his clone. While the game’s story is frustratingly left hanging (due to Lucasarts shutting down), it’s a fun one. 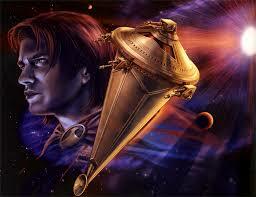 But as said, the main attraction here is the character of Galen Marek. Set up to be a photo-negative of Luke Skywalker, you get a glimpse of what would have happened if Darth Vader took a powerful force user as an apprentice. And boy, was he powerful. In no Star Wars game before or since haveyou been able to use the force in this way. Vader taught Marek to use the force as demolition crew would use a wrecking ball. You get to blow apart doors and ships, fry/burn to a crisp with lightning, throw across great distances/heights, disintegrate, and cut apart storm troopers – and none of this is overly bloody. Plus, in the second one, you get to PUNT EWOKS in a bonus level…which is…just so very satisfying. See last weeks post, it was my gateway into the EU, so I will always have a special affection for it. Plus, the Outrider. Love that ship. Aside from recreating several iconic battles from the original trilogy (the death star trench run in both of the first two games, the battle of Hoth, and the awesome battle of Endor), these games add several compelling battles that we didn’t know, or as the bonus level from the first game – ones we had only read about against the World Devastators in Dark Empire. 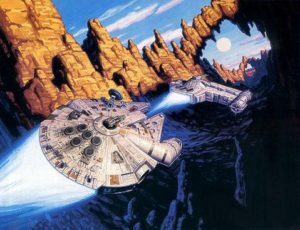 Being able sit at the controls of all the rebel vehicles (X, Y, B, and A-Wings), some Imperial (Tie Fighters/Interceptors/Bombers/Advanced-X1’s/Hunters) and other ships (The Millenium Falcon, Slave 1, a Naboo Star Fighter, a Jedi Starfighter, and a shuttle) increased the games replay value. I wish they still made these…and were for the PS4. The Legacy story was a solid one, and setting it a 100yrs after where the novels were at the time (39 ABY) allowed it some autonomy and put it in a good position. It could exist concurrently with the novels, incorporate some of the happenings, but largely exist on its own. This allowed the team at Dark Horse to do almost whatever they wanted to do. I mean, it’s Star Wars, so there are similarities – an evil empire has taken control, the dark side is strong, and the Jedi are all but extinct – but that’s almost always Star Wars, that’s the formula atleast 60% of the time. But things are different. You have a huge Sith army, a group of almost gray Jedi in the imperial knights (rocking white lightsabers), and Cade Skywalker – the polar opposite of Luke and Anakin in every way (constantly giving into the dark side, trying not to be a Jedi, addicted to drugs, and a mercenary who has collected bounties on fellow Jedi). You get to see characters grow, contrasted against what came before, some surprising cameos (with great ways of working them in) and a lot of solid action. If you can find these, they are well worth a read. This is a case of liking what something represents more than what we necessarily got. 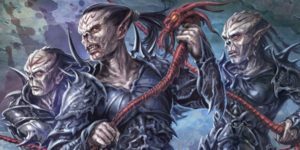 The Yuuzhan Vong war was an event that tied all titles in the franchise together, shook things up – Chewie, Anakin Solo, and others died, Coruscant was destroyed. It gave the Jedi an enemy that wasn’t the Sith and they struggled against (the Vong had weapons and armor resistant to lightsabers), it gave the New Republic an enemy that wasn’t someone trying to reunify the Empire – basically, it shook the stories up and broke them out of the repeating cycle they had (for the most part) been in. Was it flawed and go on too long? Absolutely. But, it gave the EU a kick in the pants and set the stage for some really good (and bad) stories going forward. Similar to Legacy, the story of Knights of the Old Republic takes place almost 4000 years before the events of A New Hope (the first game is set in 3956 BBY and references events even earlier). Setting things back then allowed to have things be similar (again, when isn’t a Star Wars story familiar for the most part) but removed it from the films enough that it could be it’s own thing, as whatever the outcome of the story it would not affect the continuity of the films. This gave you a very open playground, and some insanely powerful and interesting characters, especially the one you play as in the 1st game – the compelling character of Revan. This whole timeline, and especially the Revan character really caught on with Star Wars fans – and is great show or anthology movie material. Man…I love what the EU did with Palpatine. They took him from the man behind Vader and turned him into THE big bad. He was pure evil. If he was to ever utter the line “I am the dark side” it would be fitting. Dude had a plan for everything: placeholder apprentices, who to maneuver into and out of power to cause conflict, who to have killed, who to exploit, and of course – where to have clones (upon clones) of yourself so your tyranny will never end. Seriously, his wookiepedia article is crazy. 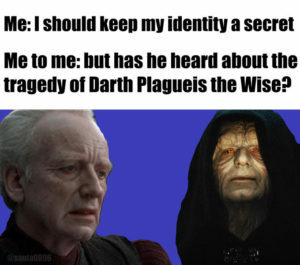 Plagueis is interesting as the man who finds and steers Palpatine. He’s a bad guy (cause he’s a sith), but not EVILLLL like Palpatine was. It would have been easy to just have name dropped him and moved on, but the EU added an interesting backstory and what he was into – midichlorian manipulation and prolonging of life – something which the force hates, and in response creates Anakin. He’s part of the grand Sith scheme, and part of Palpatines plans. I love that they added him, and would love to see him added back into the cannon. This is the number one part, easily. The EU was borderline masterful at course correction. Originally, the writers weren’t allowed to touch the era’s before the original trilogy, save for things like who created the death star and smaller stuff like that. When the prequels came out, it changed what the backstory to much of the saga, throwing some stuff into disarray. 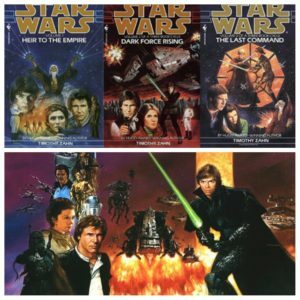 But what we started getting then was both books that would fix those that were in error (ie I, Jedi correcting stuff from the Jedi Academy Trilogy) AND books that would expand on earlier events and incorporate stuff from prequel era info and stuff from books that took place later in the timeline. For example, the Outbound Flight Project was something briefly talked about in the Thrawn Trilogy (as it was tied to the backstories of both Joruus C’boath and Thrawn himself) – but later, the novel Outbound Flight tied in Sidious’s plots to destroy the Jedi to the story (which tied into why Outbound flight was lost) and hints at the Yuuzhan Vong war. This kind of thing creates a greater tightness and unity in story across the franchise, and I loved it. I hope the new materials in the cannon is aiming to achieve the same thing. On a side note, there’s a really solid Christian podcast called The Pop Culture Coram Deo Podcast. 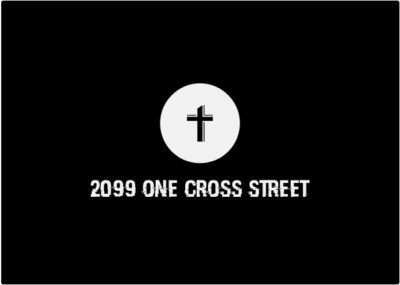 It looks at movies and pop culture from a Christian perspective (ie what you can find biblically and spiritually) and is definitely worth a listen. You can check it out by clicking here. What were some of your favourite parts of the EU? And what would you love for them to re-add into the cannon? Let me know in the comments, I’d love to know! Hope you enjoyed the post, and God bless my friends!